It is no surprise why Brazil has become one of the top-picked tourist vacation destination countries in the world. It is breathtaking, highly cultural and offers endless possibilities of adventure for anyone. This country offers beautiful beaches, mysterious jungles, cultural buildings and some of the hottest nightlife on the planet. Brazilian people will welcome you into their cultural traditions and fine cuisine. They are a loving society that , as diverse as they are, all unite together to celebrate their country, religion and of course soccer. Brazil has more professional soccer teams than any other country in the world and is anxiously preparing to host the 2014 World Cup. Two years after that, the country will also host the 2016 Summer Olympics in Rio de Janeiro. While visiting Brazil, you will want to view the Cristo de Redentor, Sugarloaf mountain and take a stroll through the Amazon Rainforest. This country offers you the opportunity to see a capital unlike any other in the world. Brasilia was designed and constructed to perfection with a place for everything. Brazil offers you Carnaval, the well known celebration party prior to lent and ending on Fat Tuesday and the country displays the largest firework display in the world on New Years Eve. 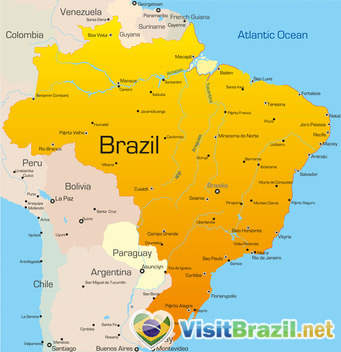 Brazil is divided into 5 regions, 26 States, over 5,560 cities and over 200 million people. It is the largest and most populated country in South America, covering nearly half of the continent. It is so large that it borders every South American country except Chile and Ecuador. The country offers some of the top rated hotel resorts in the world and most romantic motels. It is the home to the famous Copacabana Palace and displays the statue of the beautiful Brigitte Bardot in recognition of her love for the country. Whether it is your first or 100th time to visit Brazil, you will always find something fresh to do and a new adventure every time. Come see for yourself why Brazil is called the most beautiful country in the world.